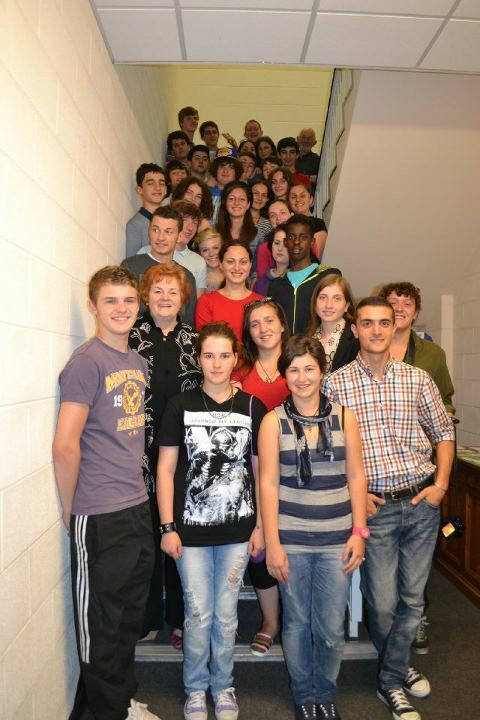 Newport, through the Newport YMCA has hosted a group of young people from the Georgian City of Kutaisi for 2 weeks . The purpose of their visit was to learn about Poverty from a different perspective, as well as the cultural and political differences between us. (not many people know that Kutaisi is a twin City of Newport since 1989). The project was funded through the Youth In Action Programme. The Georgians were shown around the City of Newport and more importantly the new modern development named Kutaisi Walk, commemorating the bonds between the two cities. They were then shown the famous ancient sites of Caerleon (Augustus Isca) and various places of historical significance within the South East Wales area (Big Pit and Monmouth) and of course London. The young people had visited the Senedd in Cardiff by invitation of Rosemary Butler, in an attempt to show them how Welsh politics works. This differs from their home country, where democracy is still a very new concept and one all show keen interest to be involved in, whether it be debates or plan to run for office in the upcoming future. Mrs Butler AM visited the Georgians during the poverty workshop, presenting to her and the UK host both what they believed poverty to be, but also ways they think it can be eradicated. Both groups of young people hosted a night in which they would teach the other about their culture and way of life. The Georgians hosted first, showcasing some amazing dancing and food. They were so proud to be able to present to us from Newport with lasting memories, along with some fantastic presents. The Newport group were second to present, where dance and culture and a fun attempt at the Welsh language was provided along with Jamaican food, illustrating how diverse a city and country we proudly live in.